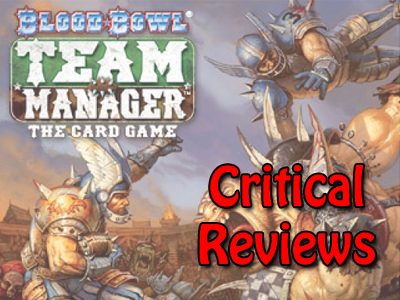 No matter if you are a lover of miniature games, a lover of American Football, or a lover of just plain *good* card games, it's time for us to look at Blood Bowl: Team Manager, the Card Game! First, in the spirit of full disclosure, I never had a chance to play Blood Bowl, the miniatures game. I know, boo, hiss. What rock was I living under and how big was it exactly? Digressing, and back to the review... I never played the table top, but I have always heard it was an excellent game and one I need to sit down with before passing through this lovely place. So, going into this game, I knew only basics of the Blood Bowl Universe. I knew it was American Football, normally played on a tabletop. I knew it was comical, but serious strategy. I knew it was lighthearted, but still competitive. And I knew it looked freaking cool! Additionally, I'm not always a fan of Fantasy Flight games and their offerings. I love the company, but not every game appeals to me. So, I was a bit hesitant with this one, but after looking at some videos online (links below), they convinced me... and I am NOT disappointed! If you are familiar with the BB Universe, this will be a bit of a refresher, but those who aren't, here goes... There are 6 teams to choose from (Skaven (Rats), Trolls, Orcs, Humans, Dwarves, and Elves) in 2 divisions, the Old World Association (OWA) and the Chaos Wastes Confederations (CWC). Each player chooses one team, takes their starting deck, shuffles up, and then the main set up begins. BBTM is essentially a Deck Building Game, but with some unique twists on it. As you can imagine, the goal is to win football games. Each "round" consists of sub phases, with each team vying for control of Highlight Cards, which if won, will result in great rewards to add to your deck, or add to your capabilities (more on that in a moment). 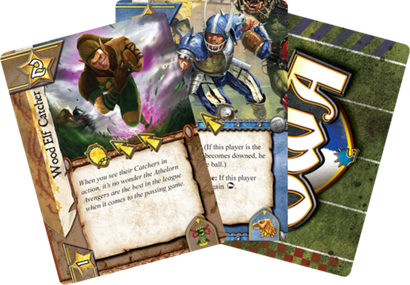 Additionally, there are tournaments, like the Blood Bowl itself, which will also see players vying for control of, providing even more rewards. The goal is to have the most fans at the end of the game. Games end after the last "Round" and the number of "Rounds" are determined by the number of players in a game. 2 player games can be as short as 30 minutes and 4 player games are, well, longer, and insane. Now, no only do you have your players in your starting deck, but there are Star Players in center OWA and CWC decks. These decks consist of powerful players, recruited to help your team in future Highlights, as well as they have Freebooter characters, which are like hired guns, powerful, but not mega celebrities in the game. Each round a certain number of Highlights are placed face up in front of all players, and beginning with the first player, each plays a character from their hand, and resolves any abilities. As you see, Cheating is a must! All other you can choose to resolve or not if they are on the player card, but Cheating, well, it's encouraged. During this ebb and flow of playing characters, you'll effect the game, other characters, and gain fans and Star Power. After all players are out of cards for the turn, all Cheating Tokens are flipped, any bonuses are applied (or negatives), and the team with the most Star Power at each Highlight wins and gets their reward. Losers will still get a small reward for participating, but usually this is much less. Staff Upgrades: Cards that don't go in your deck, but stay on your side, and allow you to use instant abilities or have triggered abilities to affect the game. Team Upgrades: Cards that don't go in your deck, but stay on your side, and usually allow powerful swings in momentum! Overall the game is extremely well designed. As you can see from the images below, the cards are colorful, exciting, and comical with flavor text. The artwork is unique and really brings the flavor of Games Workshop minis alive. The concept of an upright character card has Star Power of X and when tackled, "taps" and has a new Star Power is well done also. The flow is very quick, and because you are constantly playing with one person dropping a character and then the next player dropping a character, there is little to no downtime, which in this player's opinion, is good in DBGs. Cheating is amazing! Cheating Tokens have a random reward and it could be anything from instant Fans to add to your total, to more Star Power, to even, the dreaded Ejections! Ejections mean that character is ejected from the Highlight and their Star Power is removed from your total at the Highlight! Brutal! Dice play a large part in Tackling, but honestly, it's fairly straight forward. There are two dice, and if you have more Star Power than the target, you will usually tackle them, assuming you don't fail, which does happen occasionally, but not in an over abundant amount. Let's face it, even someone like Reggie Bush who never tackles much sometimes gets a good lick on someone. 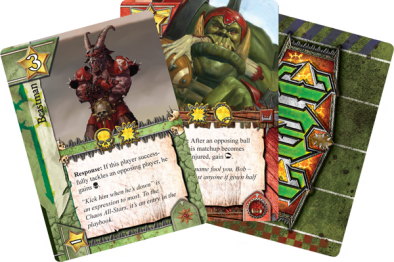 I've played multiple games of Blood Bowl and none are the same. Even with the same teams against the same teams, the Cheating factor and Tackling make it a unique experience every time. To boot, you may only draft a small handful of Star Players to your deck, so ensuring they add synergy and choosing the right one is key. There is enough strategy to keep you coming back, and enough blocking and tackling to make even the most casual of gamer happy. Additionally, the game moves best with 3 players I have found. 2 is a blast, but 3 causes much more preparation, strategy, and planning. Overall, this is something I recommend highly for your collection, and one that won't disappoint the staunchest of the table top fans, or the most inquisitive of card game fans. Here are some additional video links from Fantasy Flight directly, and really do a great job of explaining the game and gameplay! Enjoy!